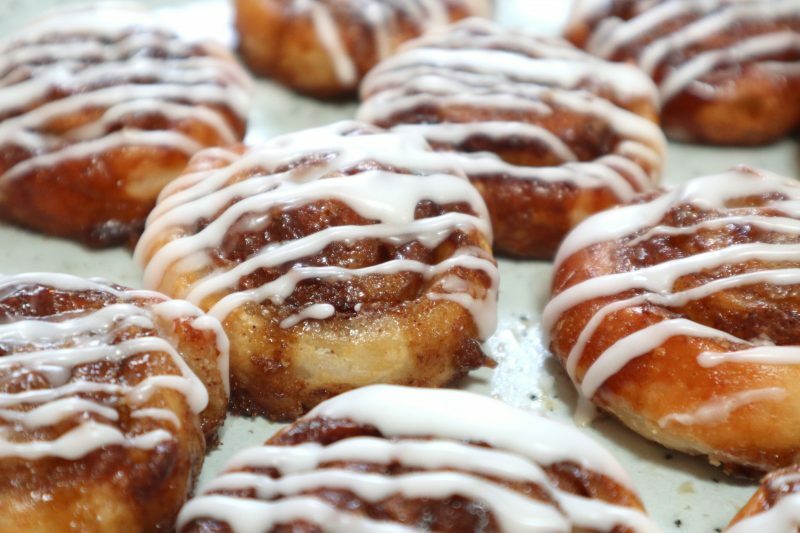 Cinnamon swirls (rolls / buns) were my all time favourite treat before I was diagnosed as a coeliac. Once on a gluten free diet they quickly became one of the things I missed the most. I tried many a recipe and it was hard to create anything even close to satisfy the craving. 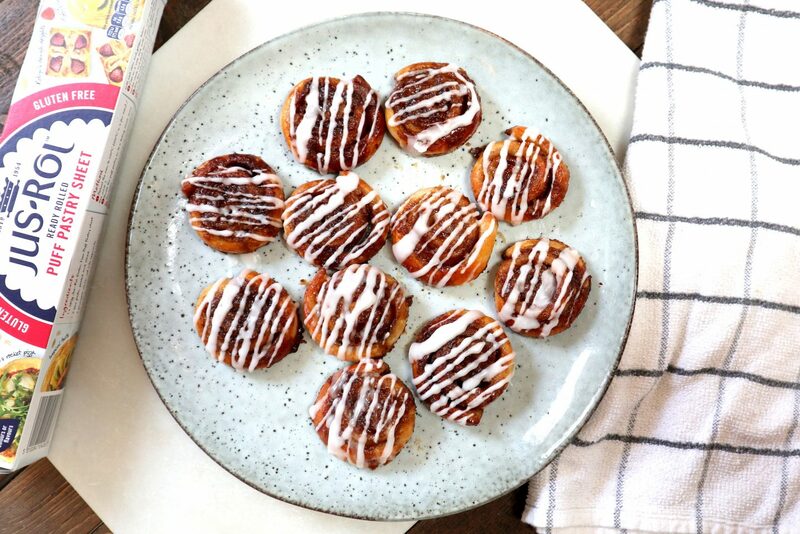 Finally, with the help of Jus-Rol gluten free pastry, I am now able to create a delicious version of these mini pastries in just 10 minutes in my own home! No joke. 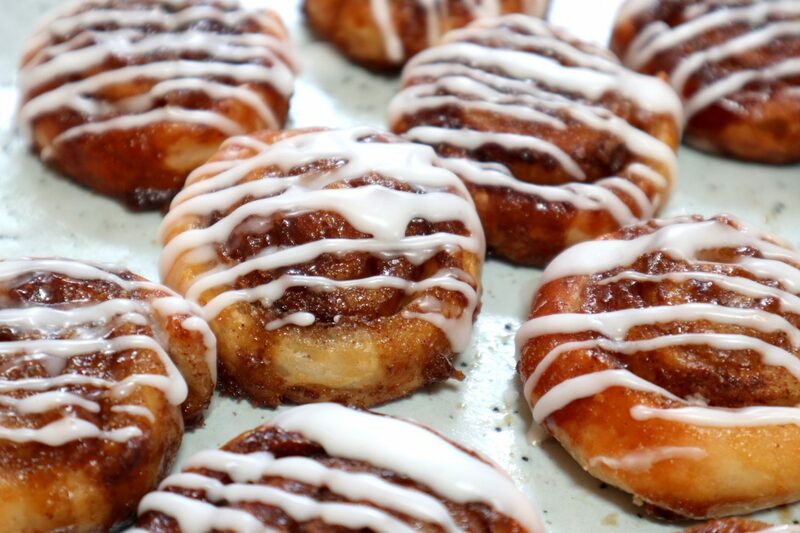 These are flakey, crispy on the outside, soft in the middle pastries filled with cinnamon goodness. They are so quick and straight forward to make, absolutely anyone could master it. These remind me so much of the ones my mum or dad would buy me from the supermarket from the fresh pastries section – so I am SO happy I can enjoy these once again! Test it out for yourselves! Unroll the pastry (the Jus-Rol version is ready rolled and good to go), leaving it on the sheet it comes on. Using your fingers, rub the butter into the pastry to cover the entire pastry sheet evenly. Next, sprinkle the sugar in an even layer all over the pastry, followed by the cinnamon. Using the sheet, roll the pastry up tightly. Cut the roll into 12 pieces, approximately 2cm wide each and place face up on a baking tray. Line the baking tray with grease proof paper as the butter and sugar can leak. 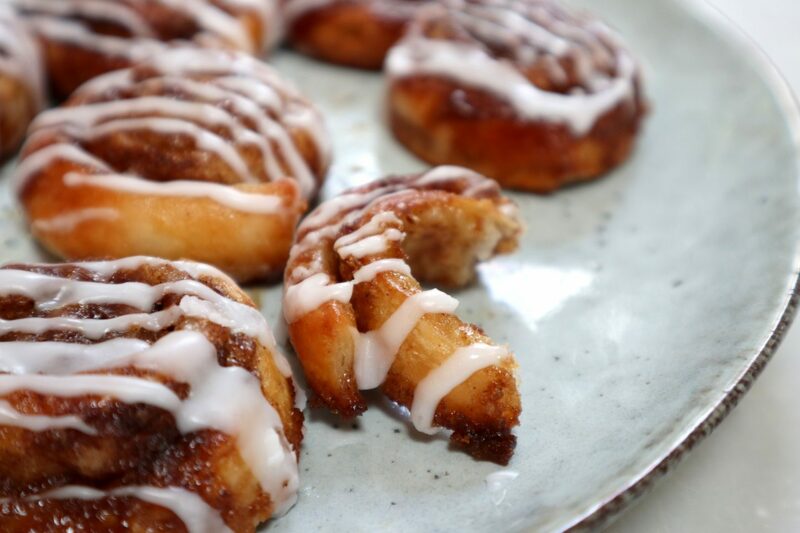 Flatten each cinnamon swirl using the palm of your hand. Beat the egg and brush it over the top of each cinnamon swirl. Remove from the oven and remove the swirls from the tray as soon as possible to avoid them sticking as the melted sugar sets. 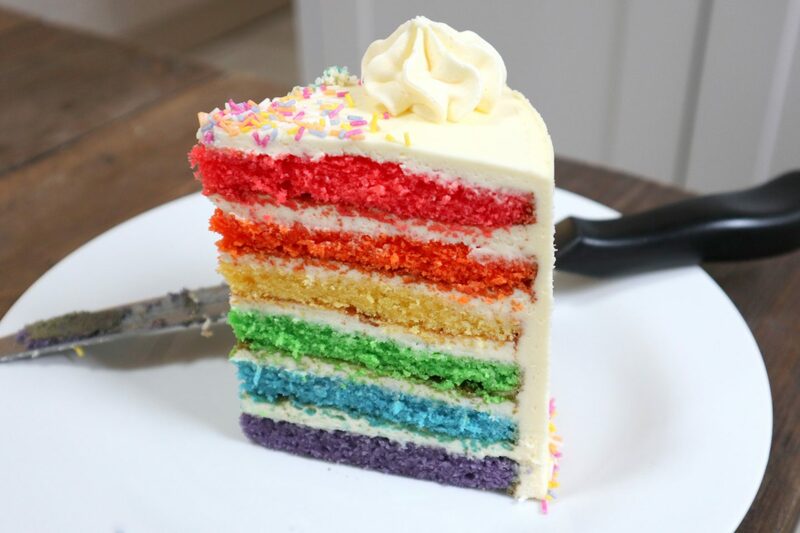 Once cooled, make a thick icing by adding a few drops of water at a time to the icing sugar. 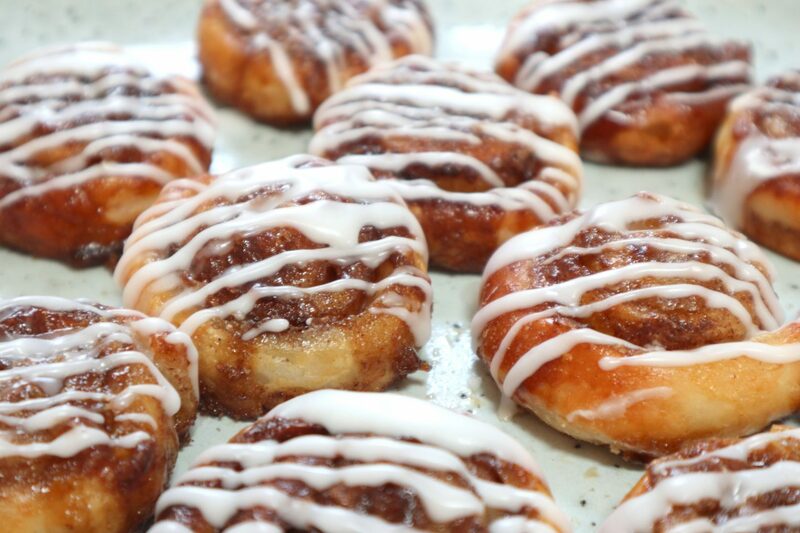 Drizzle over the top of each cinnamon swirl. These can be reheated in a microwave for 20 seconds. These are so delicious, you will want to make them time and time again. I hope you LOVE these, I know I do!! *Disclaimer: This post is not sponsored. All opinions are honest & my own.